CD reviews: "Giant Steps," "My Favorite Things," "Blues & Roots," "The Inflated Tear" and "Free Jazz"
These reviews first appeared in the April 4, 1998 edition of the American Reporter. To hear the old-timers tell it, contemporary jazz is, if not dead, then certainly comatose. "No new ideas anymore," they mutter into their drinks, watching the bourbon swirl around the melting ice. "It's all the same old stuff." The easiest thing is to simply roll your eyes at such talk  the young lions of jazz have pressure enough trying to please the guardians of all things artistic without having the past sanctified into some unreachable ideal. But then sometimes you're forced to confront the discomfiting thought that maybe, just maybe, the geezers have it right. Such an occasion now comes to us via Atlantic Records, which is celebrating its 50th anniversary this year. As part of the celebration, the venerable jazz and R&B label is reissuing some of its classic albums in conjunction with Rhino Records, the reissue specialists. And the first five jazz releases in this project are an impressive lot  one that makes a snappy retort to critics of the contemporary scene seem less ... well, smart. Each album is among the above artists' very best. Coltrane's "Giant Steps" and "My Favorite Things." Mingus' "Blues & Roots." 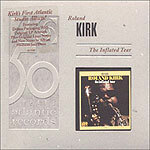 Kirk's "The Inflated Tear." Coleman's "Free Jazz." Each album helped define the very nature and voice of jazz  of American music, for that matter. It's hard to imagine the emergence of punk without the trailblazing dissonance and open structure of Coleman, for instance. Most amazingly: All five albums came out within a two-year period. So maybe the rocking-chair set is onto something. Because, quite honestly, it's hard to think of five such influential and artistic jazz albums from the past 20 years, never mind two. Really, outside of Miles Davis' final effort, "doo bop," which married rap and jazz to spur the development of acid jazz back in 1992, and Wynton Marsalis' two most ambitious projects  1993's "Citi Movement: Griot New York" and last year's "Blood on the Fields"  it's hard to think of any jazz recordings from the last two decades as timeless as these five reissues from 1960 and '61. Are these recordings perfect? Hell no  these artists take far too many chances for that to happen, which is part of the reason they still sound so fresh and happening 37 years later. What these releases remind us is of a time when excitement and creativity were far more in evidence, when there was not only a willingness but a strong desire to experiment. Even three and a half decades after their original releases, these recordings grab and hold your attention with all the new ideas swirling around  concepts we still haven't fully explored yet in the intervening years. With Rhino handling the project, you know the packaging is first-rate. The original album covers are reproduced in their entirety, albeit reduced in size to hold a CD instead of LP. That cover then slips into a larger sleeve that also contains a booklet for each release, with new liner notes by such luminaries as Nat Hentoff (who also wrote some of the original liner notes in this series  and what a joy to see how he's continued to grow in grace and wisdom through the years), Gunther Schuller and longtime Atlantic producer Joel Dorn. Each of the releases contains bonus tracks and/or outtakes; "Giant Steps" has eight extra songs to complement the seven sides from the original release, including three different takes of the title track. And Coleman's 38-minute long "Free Jazz" can be listened to in one setting, without having to flip the record over to side 2. These are wonderful packages  great music given wonderful context and packaging. And they're hardly the only groundbreaking albums in Atlantic's vaults. Here's hoping for more reissues in this series.